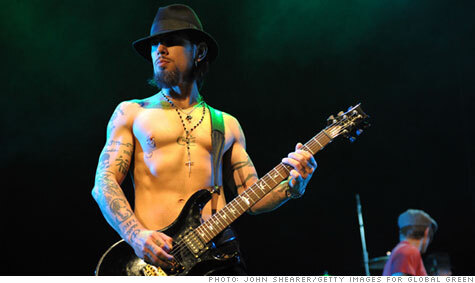 NEW YORK (CNNMoney) -- Are you a rock star wannabe? If you're a Citibank customer, you can attend adult rock band camp by cashing in your rewards points. Members of Citi's Thank You rewards program can now sign up for camp by using around 385,000 points. Of course, that takes a lot of spending since rewards members accrue one point for every dollar they spend. Customers also have the option of using a combination of reward points and cash, with the typical camp session costing around $3,000. Citi partnered with Rock n Roll Fantasy Camp to offer four programs, including a four-day session in New York where the most talented campers will be invited to play Blood Sweat and Tears songs as the opening act for the Woodstock festival. It may sound wacky, but Citi (C, Fortune 500) is confident its rewards members will flock to the new offering, since a large number of its customers already use their points and Citi credit cards for music-related purchases. "We're focusing on what our customers like and what they want to do," said Ralph Andretta, executive vice president of Loyalty and New Products at Citi. "Sometimes people don't wake up one morning and say, 'Hey, I want to go to rock band camp,' but who hasn't dreamed of being a rock star as a kid?" At the camps, Citi customers will be divided into small groups to work with real live rock stars, including Sammy Hagar, Phil Collen of Def Leppard, Dave Navarro of Nine Inch Nails and Chad Smith of the Red Hot Chili Peppers. This dream vacation is part of Citi's Wish Fulfilled option, where customers can ask for any type of reward they desire and Citi will try to grant it. Andretta said that in the past, customers have requested -- and been granted -- things like sky diving, hot air ballooning, a volcano tour, a theology class and one customer even used his reward points for dental work. So while technically customers could have requested to use their points for rock band camp in the past under this program, it would have been a lot more work. "Customers could have done it, but you would have had to come up with the idea, find the camp, make sure there is space available and do it all on your own," said Andretta. "Now we're putting prominence and weight on it, and we will arrange everything for you and hold your hand through it to make sure you have a great experience." And Citi isn't the only credit card issuer offering unique rewards and focusing more on experiential rewards than typical items like hotel reservations or DVDs. Chase rewards customers, for example, can choose between items like expert DJ lessons, private art lessons and even a class in Irving, Texas, exploring the art of metal embossing. $5 ATM fees coming our way?